Films like "Titanic" and "Braveheart" should have been shot in 65mm simply because they are "big" movies. But shooting in 65mm doesn't need to be limited to the obvious mega productions. Small independent movies would benefit enormously with the sharper picture. I'd enjoy seeing films like "Enemy of the State", "As Good As It Gets" and "You've Got Mail" and many more, shot on 65mm stock and presented in 70mm. 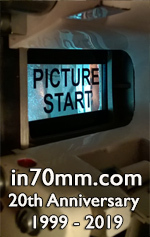 I and most of our readership would certainly seek out cinemas presenting films in 70mm. Reprinted from Dallas Observer by permission from Robert Wilonsky. An Interview With Jim Ward, V.P. of Marketing, Lucasfilm, Ltd.
Jedi Knights, Imperial Storm troopers and Tusken Raiders rejoiced this past summer of 2002, when it was announced that "Star Wars: Episode II-Attack of the Clones", would be released in the IMAX format. For how many years have fans of the original trilogy, and now prequels, wished upon the stars above Skywalker Ranch for the films to be shown on the giant IMAX screen? One of the biggest challenges in doing an IMAX film about "Lewis and Clark" is trying to capture the incredible scenery they would have experienced almost 200 years ago. Greg Kimble is a classically trained visual effects supervisor with credits dating back to the Special Edition of "Close Encounters". An avid "Trekie," his first screen credit was on the original Star Trek film, where he shot all the Klingon war birds and the V'ger craft. An Interview With Roy Conli, Producer of "Treasure Planet"
I came to Disney in 1993 and worked on the development of "The Hunchback of Notre Dame" and was co-producer on that film. I went to France to run the French unit, and then ended up staying for three years running the French studio, where I worked on the production of "Hercules" (1997) and "Tarzan" (1999). And then I came back here five years ago to produce this film. And previous to that, I was in the theatre. Immersive Cinema Technologies Will it Continue?